In this 3rd and final part of this pAsuram, we shall see the meanings of the last two lines of the pAsuram and how this pAsuram conveys the meanings of first line of dhvaya manthram as well as parts of thirumanthram and charama SlOkam. kAmbaRaththalai siraiththu – removing the hair with the root. kAmbaRa – making sure that the connection with other upAyams (other means such as karma, gyAna, bhakthi yOgams, thirunAma sankIrthanam etc) is severed; thalai siraiththu – severing connection with other instruments being carried inside the head, which are like sins because they are preventing from attaining the goal – in other words, removing the esteem that “I am my protector”. Why is there a reference to hair? Since hair is supposed to add beauty to a person and to add esteem, AzhwAr is using this as a simile for the thought that the person has, that he is his own protector. In olden days, when kings resorted to tonsuring a person, the reason was to lower his esteem. This was also the reason for sanyAsis (those who have renounced everything in this world) and EkAngis (ascetics) to tonsure their heads [they want to rid of their self-esteem themselves]. Thus, since we see people tonsuring themselves to remove their self-esteem, AzhwAr is using this metaphor to denote removal of esteem that one gets from following other upAyams (means). charama SlOkam, in its first half, states that after renouncing other means only can one hold on to emperumAn. AzhwAr denotes this meaning in the term “kAmbaRath thalai siraiththu” considering the greatness of its meanings, in an indirect manner. SAsthram referred in an indirect manner only when it spoke of “dhvA suparNA sayujA sakAyA..” (muNdakOpanishath 3.1.1) (there were two birds with beautiful wings and similar qualities, sitting on a tree (referring to jIvAthmA and paramAthmA)). Thus AzhwAr also, like SAsthram, uses simile to convey his intended meanings. un kadaiththalai irundhu – kadaiththalai can be transposed as thalaikkadai which means at the door step. In dhvayam the term charaNa refers to the divine feet of emperumAn. AzhwAr refers to that word here. Why is AzhwAr not mentioning the divine feet directly? Looking at this lowliness, he is ashamed to go near emperumAn’s divine feet; he is unable to leave emperumAn and indulge in worldly matters. Hence he is staying at the door-step of emperumAn. vyAkhyAthA mentions about an incident in the life of thirukkaNNamangai ANdAn, a disciple of SrIman nAthamunigaL (the preceptor who received all the 4000 dhivya prabandham from nammAzhwAr). One day ANdAn saw a person killing another person with a knife because the other person troubled his pet dog. Knowing that he will be punished by the King for his act of murder, he killed himself with the same knife. thirukkaNNamangai ANdAn, on seeing this, thought “if a samsAri, who thinks that dhEham (body) is AthmA (soul), can have so much affection for his dog which stays at his door step and eats whatever he feeds it, paramachEthana (emperumAn) will never let down those who stay at his door-step and hand them over to yama (dhEvathA for justice)”. Having affirmed this, thirukkaNNamangai ANdAn left his relatives, his possessions and his wife, refrained from working for himself, and engaged fully in emperumAn’s kainkaryam and till his end, stayed at the entrance of the temple at thirukkaNNamangai. irundhu – chEthana, who, due to attraction to worldly pursuits was running around, stays like a ship which has been anchored. thaththirIya upanishath Anandhavalli 7.2 says “yathA hyEvaisha EthasminnadhruSyE anAthmE anirukthE anilayanE abhayam prathishtAm vindhathE I atha sO’bhayangathO bhavathi II” (when a person, in order to rid himself of his fear for samsAram, attains affection called as bhakthi with emperumAn who cannot be seen by others, who is without (prAkrutha) SarIram (physical form that chEthanas have), who cannot be described by words (such as dhEva, manushya etc), who is without any support (for himself), he becomes fearless of samsAram). In the same way, the samsAri attains emperuman and becomes fearless. vAzhum – once ISvaran becomes the means (path to attain him), enjoying him becomes living in prosperity. Another interpretation is – since it is irundhu vAzhum, having him as the means (path) itself is prosperity. sOmbarai ugaththi pOlum – Looking at the joy in emperumAn’s divine face, AzhwAr is wondering “when you look at those who have given up the responsibility of protecting them to you and who are lazy about protecting themselves, is this how your divine mind would feel joyous!?”. The term vAzhum sOmbar refers to those who are sloth about living for themselves but who are living only for emperumAn. Those who live for themselves are termed as kedum sOmbar (ruinously lazy people). To differentiate from such people who ruin themselves, AzhwAr is using the term vAzhum sOmbar. These people will not give up their daily ritual [such as sandhyAvandhanam etc] or special ritual [such as amAvAsya tharpaNam etc] because they do not believe in SAsthras or they are lazy. They will follow such rituals as emperumAn’s order and as a kainkaryam. They will be foremost among the Asthikas (believers of God) and will hold on to emperumAn, who does not expect anything from them for being their means, enjoy him as a way of passing their time in this world, and will be lazy when it comes to protecting themselves here. ugaththi pOlum – it appears that you [emperumAn] seem to enjoy these people as you enjoy nithyasUris (permanent dwellers of SrIvaikuNtam). emperumAn asks him, “How did you know this matter [that I enjoy those who are lazy about protecting themselves]?” . . . .
sUzhpunal arangaththAnE – the fact that you have come to thiruvarangam (SrIrangam) and are lying here, seems to denote this. For those who look superficially, it would appear that emperumAn is lying because of the nice streams and greenery around thiruvarangam. Only those who dvelve deeper would understand that he is lying here in anticipation of a vAzhum sOmbar, without feeling lazy (himself). kAmbaRath thalaisiraiththu denotes sarvadharmAn parithyajya in the first part of charama SlOkam, as it refers to giving up all the other upAyams (means to attain emperumAn) as a prerequisite for holding on to emperumAn as the means. sUzhpunal arangaththAnE un kadaiththalai denotes the meaning of nArAyaNa padham (word) in the first part of dhvaya mahAmanthram, facilitating taking shelter under emperumAn through his four auspicious qualities of sauSeelyam (being easily approachable), saulabhyam (being simple), vAthsalyam (considering faults as qualities) and swAmithvam (being the swAmy or master). pirAtti, being the identity for proving emperumAn’s existence and being indicated by nArAyaNa sabdham itself, is denoted by the word un [un kadaiththalai] in this pAsuram. In the next (40th) pAsuram he is going to show this clearly. It has been shown already that kadaiththalai indicates charaNau. Irundhu vAzhum refers to the deep belief in the means through the word prabadhyE (deep belief that emperumAn is the means) and that this deep belief will be very sweet to the person who surrenders. sOmbarai refers to the quality of the person who surrenders, as in the word prapadhyE. 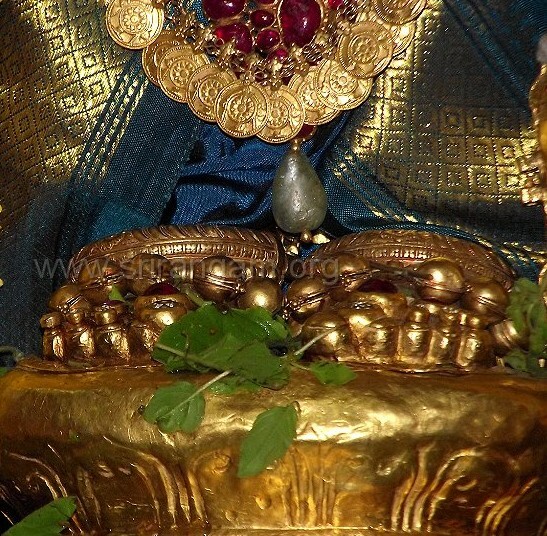 Thus, this pAsuram describes in detail the meaning of dhvayam, and also shows the meanings of several terms in thirumanthram and charama SlOkam. We shall now go on to the 39th pAsuram. This entry was posted in mudhalAyiram, thirumAlai on December 3, 2016 by T N Krishnan.